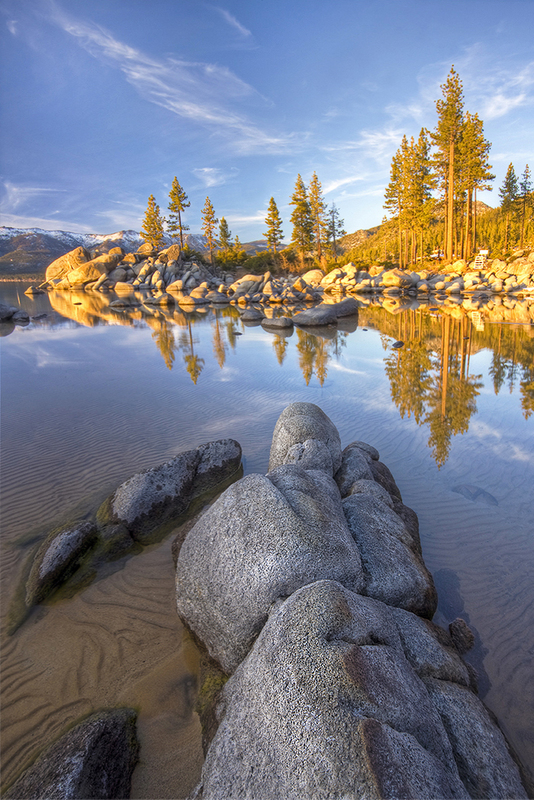 Breathtaking Sand Harbor, on Nevada's east shore of Lake Tahoe, is unique for its white, fine-grained sandy beach. Most of the beaches on the Nevada side are course sand. The difference is thought to be due to the prevailing breezes that blow through Sand Harbor. The mountain breezes are also responsible for the mesmerizing pattern of ripples in the sand beneath the water's surface. Taken just before sunset, this image captures a rare, calm moment between storms, when the water was at peace, reflecting a crisp mirror image of the beauty that surrounds it.